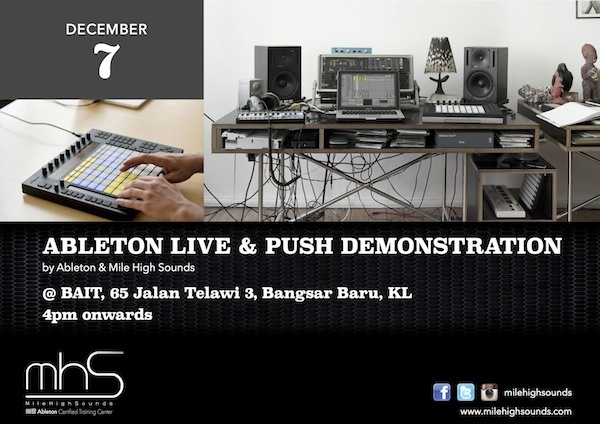 Free Ableton Music Production Workshop Tomorrow Thanks To Mile High Sounds! The great guys over at Mile High Sounds are kicking off a workshop for all enthusiasts of the music creation tool Ableton Live! Tomorrow from 4pm, attendees will have the opportunity to check out an exclusive presentation of Ableton’s Live 9 music production and performance software and innovative new hardware push. Headed by Sam Counihan from Berlin as well as Malaysia’s only Ableton Certified Trainer, Reuben Samuel this is an exclusive opportinuty for enthusiasts to learn and explore more about music production as these experts will be showcasing the workflows and technology that has made Ableton’s products a favorite among musicians, DJs and producers the world over. Ableton makes Live, a software used by musicians all over the world to create and perform music and Push, a new hardware instrument for intuitive music-making. With these products Ableton is at the leading edge of a long tradition of instrument makers. From the smallest bedroom studios to the world’s biggest stages, artists of all styles, skill levels and genres rely on Ableton for the tools that inspire. Following the presentation, A-MarQ, a DJ trainer at Mile High Sounds, will be demonstrating the features of Pioneer’s RMX1000 effects unit. Guests can also expect to be entertained by DJ sets later that evening featuring Ableton’s own “Seven Days” aka Sam Counihan and Mile High Sounds’ DJs including Lish, A-MarQ, Blastique, Abdel Aziz as well as student alumni. Participation to the workshop is Free Of Charge but you’re encouraged to head on over to the form here to guarantee your space! BAIT is located at 65 Jalan Telawi 3, Bangsar Baru, Kuala Lumpur.